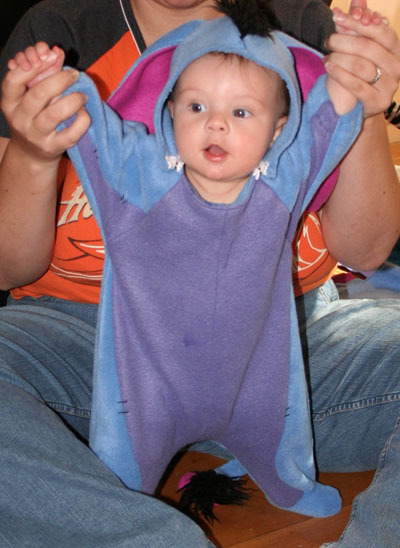 Mom finished my halloween costume yesterday, and they made me try it on today to see if it fits… They said I was dressed as Eeyore, but I don’t know what they are talking about. Dad was sneaky and took a closeup when I wasn’t looking! You are too cute and your mom is so clever! When I come up to your house on Saturday, I’m going to have to read you a story about Winnie the Pooh and Tigger and Eeyore. Eeyore is a donkey, and he likes to eat thistles. Tigger doesn’t like thistles, he likes malt. There’s a great story there, and we’ll have to read it together. This is adorable!! 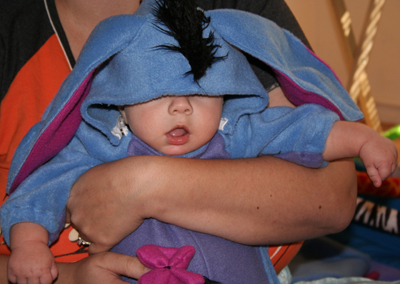 I’m due in 7 weeks and would love to have the baby’s first Halloween costume be Eeyore!! Was there a pattern you followed to make this!? If so, would you mind sharing? Previous Previous post: I’m Eating!